Forced to flee the brutal pogroms of Europe, Jewish immigrants sought refuge in the beauty of Boston's North Shore. Drawing on their artisan skills, many found work in the tanneries of Peabody and the shoe factories of Lynn, while other enterprising Jews established their own businesses in Salem and Beverly- from butcher shops and groceries to newspapers. 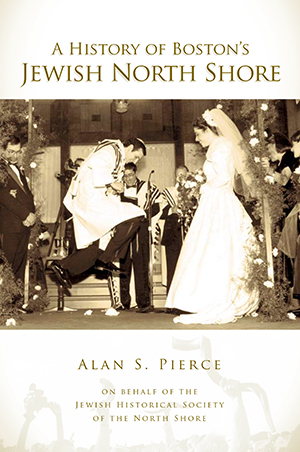 Alongside fellow members of the Jewish Historical Society of the North Shore, Alan Pierce has carefully assembled a collection of personal histories from generations of Jewish families. Celebrating the rich flavors of Jewish culture, these accounts capture familiar faces, such as renowned athlete Herb Brenner, and recognizable landmarks like the Kernwood Country Club and the Dolphin Yacht Club, innovative establishments open to all regardless of race or religion. With entrepreneurial spirit, a little determination and plenty of faith, the North Shore's storied Jewish communities have etched enduring marks on its streets and in its synagogues. Alan S. Pierce is president of the Jewish Historical Society of the North Shore. Along with members of the society, he is proud to have helped produce two books detailing the rich history of Jewish migration to Boston's North Shore over 100 years ago and celebrating the vibrant community that has evolved.Alan is a frequent lecturer in the community in addition to his busy law practice. Alan lives in Beverly with his wife Donna where they both are active in their synagogue, Temple B'nai Abraham. Alan and Donna also are members of Congregation Sons of Israel in Peabody which recently celebrated its 100th anniversary. Alan's great grandfather Jacob Morris was one of the founders and it is to his parents, grandparents and great grandparents that he dedicates his work.